The Flash settled for their second tie of the season after having a commanding lead in the second half. When Sky Blue’s Allie Long connected on the penalty kick to pull her club within a goal of WPS leading WNY Flash last Friday night, those fans who shrugged it off would learn soon enough how dangerous such complacence could be. Perhaps it was because the Flash shrugged it off, continued to play uninspired as if the match was already in the bag, as if it would take a penalty kick in order for this team or any to score on them, that Sky Blue’s Casey Nogueira was able to get close enough to have a virtual penalty shot against Flash keeper Ashlyn Harris in the 88th minute to tie up the match. Action on the feld has been good in 2011, but off the field issues persist for the WPS. It seems a decade ago but it was only last Fall, when rumors abounded that two WPS Franchises were on the verge of folding. One: The Bay Area’s FC Gold Pride, had just captured the league championship. The rumors turned out to be true. The other: Washington Freedom appeared to be rescued by telecom startup mogul, Dan Borislow, who would eventually move the club to South Florida and re-name it after his company: Magic Jack. 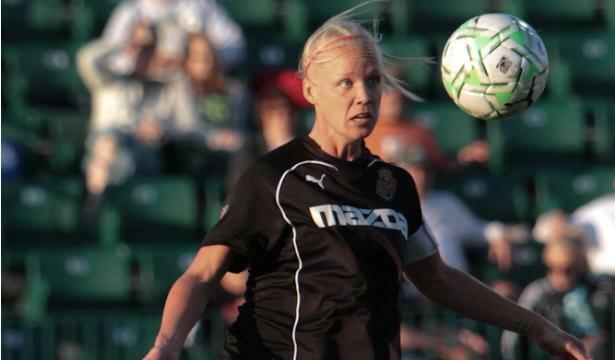 A third franchise, The Chicago Red Stars, not even rumored to be in trouble, was unable to attract additional investors and suspended play for the 2011 season. Chicago and Gold Pride joined Los Angeles and St. Louis in the dumpster of defunct original league franchises, leaving only Boston, Sky Blue FC (New Jersey) and Magic Jack of the original seven clubs, along with expansion teams Atlanta and Philadelphia. League officials had already stated that they needed six clubs in order to have a season. Enter Buffalo Meat Mogul Joe Sahlen, who upgraded his W-League Champion Buffalo Flash to the WPS as the sixth franchise. That move appeared to save the league for the 2011 season. 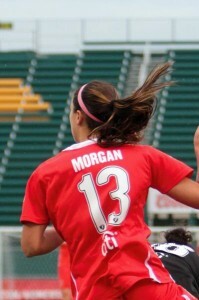 Alex Morgan has emerged as a star for the newest team in WPS. It only took four minutes for the expansion team from Women’s Professional Soccer’s smallest market to score on the defensively strong former league champions Sky Blue FC from New Jersey. Swedish international Caroline Seger tallied her second goal of the season, fed by rookie sensation, Alex Morgan. 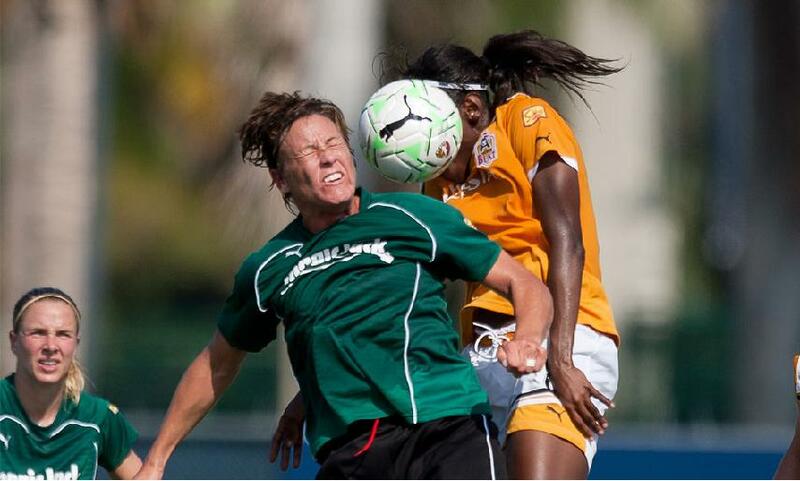 Later in the half, it was Morgan who would score on a pass by Brazilian superstar, Marta. Late in the second half, the same combination would reverse roles and Morgan got the goal, taking the Western New York Flash into half time with a 2-0 lead. In fact, the Marta-Morgan combination has become very effective in the past 2 and a half games they’ve played together. On Sunday, at the Flash home opener, Morgan scored her first WPS goal assisted by Marta. The two make an interesting tandem in that 25 year old Marta is well established as the world’s best woman ever to play the game, while Morgan is just beginning to look like she could be the next Marta, or at least the next Mia Hamm, as the best U.S. player to come along since Hamm dominated the world and the women’s game. The visitors made the game interesting for a few minutes by closing to within one goal after substitute Adriana scored on a spectacular high arching shot within a minute of entering the pitch. But it wasn’t long before the M & M attack returned the game to a safe lead for the home team. 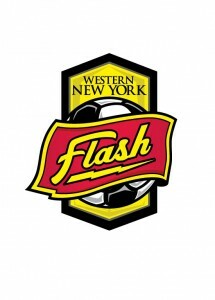 The Western New York Flash won their home opener 3-0 over Atlanta. Any questions that remained (and this writer raised several in previous articles) about the chemistry between Marta and her new team, WNY Flash, and about the reception the Flash would receive at home, were settled at the Flash’s home opener Sunday in Sahlen’s Stadium. Before anything more is said, this writer needs to eat some Sahlen’s hot-dog crow. After only managing a tepid tie with Atlanta in Atlanta last week, on Marta’s debut with the club, I suggested the insertion of the Brazilian superstar was a detriment to team chemistry. Without Marta, the Flash made a powerful statement the previous week soundly defeating a much better Boston Breakers squad, and it appeared that Marta would be no help to the already stacked roster, and perhaps would be an energy drain. Remember the bumper sticker, “What if they threw a war and nobody came?” And then there’s the conundrum about a tree falling in the forest when no one is there. As the third season of Women’s Professional Soccer draws near, it is possible that the world’s best women’s soccer team will be the tree in the forest unobserved, the war left un-attended. Western New York is already the center of the women’s soccer world in the sense that meat mogul Joe Sahlen, third generation owner of Sahlen Packing Company in the Buffalo suburbs, singlehandely saved Women’s Professional Soccer. Had Sahlen not come forward offering to buy in with an expansion team, the league would have folded for lack of teams. After 2010 league champion FC Gold Pride (Bay Area) folded and the Chicago Red Stars suspended play for a season while looking for additional investors, the five remaining clubs in the league would have been one member short of what league management had determined to be the minimum number of teams required to have a meaningful season. Joe Sahlen, third generation owner and CEO of the family meat packing business is also owner of WPS’s newest club, Western New York Flash. The announcement, released on the day his club made Alex Morgan the first pick in the league’s college draft, put Sahlen, his company and his Flash in dual roles on center stage in Women’s Professional Soccer. Shalen has already created a unique and ingenious business model by which his team’s business operations will be run through the meat company’s front office, requiring only additional salaries for competitive aspects of team operations, while also using the team as part of his overall marketing strategy, has added further value to the Sahlen brand by becoming a sponsor of the league. The deal, which includes a “Sahlen’s” logo patch on all WPS team uniforms throughout the 2011 season, was announced by WPS CEO Anne-Marie Eileraas prior to the 2011 WPS Draft at the NSCAA Convention in Baltimore, Maryland.